Supplements. A crazy topic. Over hyped and over used yet possibly one of the easiest things we can do to enhance health. Personally, I believe supplements should be just that: a supplement. I like their use as a purposeful, temporary and measured treatment. Not perpetual, excessive or reckless. A supplement used for a specific reason. I understand both sides of the argument. We shouldn’t have to take any supplements. We should get all our nutrients from whole, real food in the right amounts, proportions and relationships. We don’t know what the body does (particularly over the long term) with concentrated, unnatural proportions of vitamins and minerals. Maybe thinking we can “outsmart” mother nature will come with a downside. Taking a bunch of vitamin D or resveratrol may end up not being the best idea when it doesn’t come within the framework of food and other cofactors. Add to it that too many people take supplements blindly and without knowing why they are taking something or how it works in context of their body or other vitamins/minerals. Throw in the fact the supplement industry is not regulated so there are inherently a lot of scams and worthless products masquerading as health and performance aids. Finally, supplements are often used to cover up or make-up for a poor diet and lifestyle which is certainly a bad long term practice. The other side argues we can never get what we need from pure food sources, particularly due to mineral and vitamin degradation/erosion and the humans’ enhanced need of nutrients in response to the stresses of the modern world. We just might need more magnesium than is humanly possible to get in the diet from the current food supply. This is very possible. There is also a great deal of research and anecdotal evidence suggesting the efficacy of supplements both in short and long term health. There are also many people who value the performance enhancing ability of supplements and feel it is more than worth any potential down side that might be associated with it. There is also a chance we have only scratched the surface in supplements as we may end up finding out how we can implement some products with only positive results. There is certainly mounting scientific evidence that there may be some very powerful products available to enhance health and longevity. Smart supplementation just may offer our body the boost it needs for optimal health that we can’t get any other way. So what is someone to do? Take supplements or not? Well, the best answer is… it depends. In thinking about how to do a write up on supplement use and recommendations I realized the easiest way for me to answer this is to tell you how I approach it and hopefully that can give you some insight into how you might approach it for yourself. I have used supplements since the late 1990s when I started to work out and creatine was all the rage. I saw some immediate benefits from taking it and I have been a believer in supplements, for better or worse, ever since. 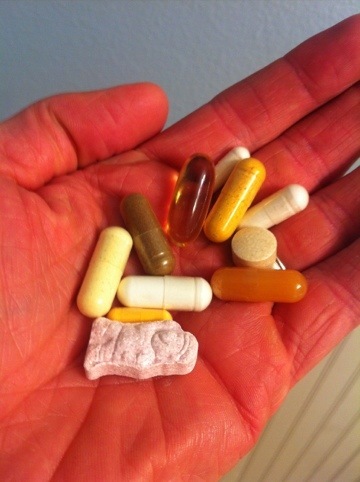 I have since used many “nutritional aids”, mostly vitamins/minerals and muscle building formulas over the years. I have spent and wasted a lot of money in the process. I have used a lot of products that I felt benefit from. I have also gone supplement free from time to time and thought it was just fine. Now I find myself somewhere in the middle and seem to have found a nice balance. Currently I do not use anything every day. I go through periods when I use things regularly and then when I run out I usually wait a while before ordering again. I like the idea of cycling though supplements and I think it gives me a break from thinking about them a few times a year. I also very rarely use a “full dose” according to the recommendations because I still like the idea of just providing a little extra nutrient imput without adding a supranormal amount of anything. I take any pills with meals (with rare exceptions) because I believe the body is more able to absorb them in the context of digesting real food. If I feel a positive impact from taking a supplement I keep using it, it I don’t then I stop using it or try it some other time under different circumstances. I am not dogmatic about any particular supplements and am certainly open to new options, new research, or potentially, the idea that supplements may end up being a complete waste of time, energy and money. At this point, I still believe in their efficacy so I use them. Only time will tell where I end up. I do know we have only scratched the surface in what we know about the body so I expect many evolutions in thought regarding supplementation in the next several years and upcoming decades. In the last year I have also used Natural Calm (for magnesium intake and relaxation), Kre Alkaline (creatine from Pure Encapsulations, for a period of hypertrophy and strength training), liver supplements, DHEA, pregnenolone, progesterone, licorice root and melatonin (from BioMatrix, for some adrenal recovery) and protein powders (Mark Sisson’s Primal Fuel, Mercola’s Pure Power Protein and Isagenix IsaPro) from time to time for convenience after workouts. My wife takes the Nutrient 950 plus K and Cod Liver Oil/Butter Oil blend and my boys take Pure Pals (Pure Encapsulations) children’s multivitamin most days of the week but are not religious about it. We will also add a probiotic powder to their drinks from time to time, particularly during cold and flu season or times of stress and/or craziness. I believe there are many other supplements that people can benefit from but every person is unique and circumstances can change on a daily, monthly and seasonal basis. An example is vitamin D. If someone is low it might be a good idea to supplement until levels rise. There would be no need to continue after that. You might also use some fish and krill oil to help reduce inflammation temporarily but stop after healing had taken place. The bottom line is everyone needs to approach their supplementing individually, wisely and keep evaluating their needs. I like the idea of multivitamins, magnesium and cod liver oil for almost everyone but, as always, people need to mind their own personal situation accordingly. Pure Encapsulations – This is where I get most of my supplements, the cleanest supplements I’ve found with smart formulations and an incredible variety of products. These are only available through health professionals. Green Pastures – The only source I trust for Cod Liver/Butter Oil. Now Foods – I have only used the Super Enzymes but have heard many good things about this company (can also buy through Amazon or other retailers). Ultralife/Synergistics – Some nice blends that can be used therapeutically. Ordered through a health care practitioner. Biomatrix – This is my go to source for hormones. Also ordered through a health practitioner. Life Extension – Great information and formulations, I am a member of their organization. Mercola – Some find him (Dr. Mercola) over the top but I appreciate his passion, products and research. Stay away from calcium and magnesium oxide as the oxide forms are not readily absorbed. Also sodium silicate and selenate would be less than ideal forms. Oil of oregano, a potent natural antibiotic, can be found at North American Herb and Spice. If looking into vitamin E, look for a mixed tocopherol supplement, such as Unique E.
Check out some more extensive Bare 5 write ups on a few vitamins and minerals: Vitamin K2, magnesium and calcium. Get information and order at home test kits at vitamindcouncil.org. Carlson’s Vitamin D drops can be found at carlsonlabs.com. Look for emulsified vitamin D if you have any problems digesting fat. If you’re looking for more detailed info and/or some of the best food sources to get vitamin D, check out this great guide from Jen Reviews. Iron supplementation can be tricky and should only be taken under some guidance. For most people, the “Heme” iron form (animal form of iron) is more absorbable and readily used by your body than the plant versions of iron and typically comes with fewer side effects. The best available supplement for iron is likely Proferrin ES. In general, if not taking heme iron, to minimize side effects and absorption, look for iron chelates, such as ferrous bis-glycinate chelate, which can be found in Albion Ferrochel. 1. Supplements can be a beneficial part of health but are not required for health. 2. Do not rely on supplements to make up for poor diet and lifestyle. 3. Do your research before you use anything. 4. Use products smartly, acutely and for a specific purpose. 5. Constantly evaluate their efficacy and role in your health plan. Thanks for reading, have a great supplemental day!